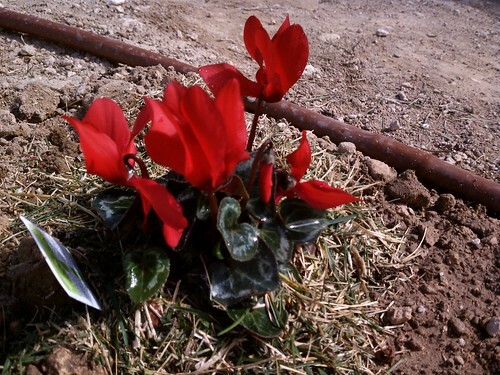 For years and years now I have wanted to grow some kind of garden in the summer. I wasn’t picky, a few pots on my porch would have made me happy, but I just never got around to it. Something would always come up, or so I would tell myself, but really I was scared. 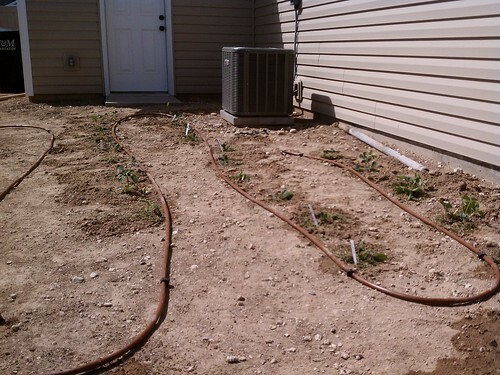 I was scared I would kill all of the little plants and waste all of that time and money. Scared I didn’t know what I was doing and would do something wrong. I don’t know, scared of letting myself fail. All of these have a ring of truth to them. My very good friend Paula (whom I miss very much) put this garden into motion last fall. She sent me a bunch of garlic to plant. Apparently if you plant your garlic in the fall and let it over-winter it tastes much better. I know, I had no idea things like this happened. I very dutifully planted the garlic in pots and covered them with leaves to protect them from the frosts and freezes of winter. I pretty much ignored them after that until a few months ago when my Father In Law David came inside and mentioned that I had sprouts. Lily and I ran outside and low and behold there were beautiful green sprouts peaking above the leaves. These little spouts set my mind on a garden for sure. Just like every year Waldo and I talked about putting in a garden and because of the garlic I started making a list of what I wanted to grow. 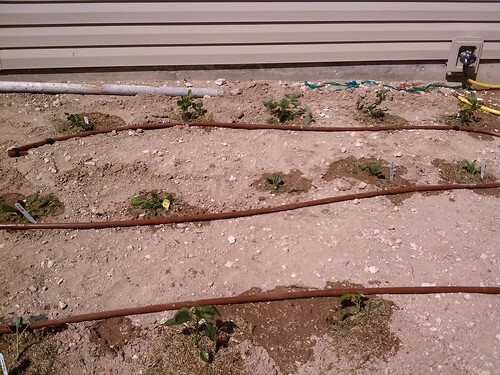 David laid drip-lines in the garden area to make life easier; most of the garden will be automagically watered for me. One day while Waldo worked Lily and I went to the store and bought some little started plants. While we were at Home Depot Lily wanted to grow a little flower so I let her pick one and she was so proud of that little plant. After getting our lovely little plants we went home and went to work. David helped me dig the holes (thankfully, I probably would have given up otherwise, the ground was much harder than I expected) and Lily and I planted all of our little plants. After they were planted we all stood back and admired our hard work. Just the act of planting the little food plants was very satisfying. I can’t wait to harvest and eat something I grew. Strawberries, spinach, broccoli, red and green peppers. 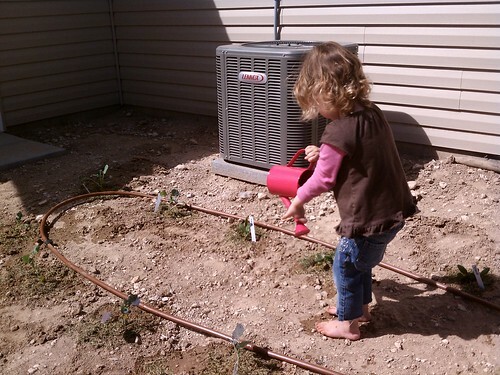 My little garden helper watering the new little plants. I have added some plants since this picture was taken. We also have some leeks, russet potatoes, white potatoes and tomatoes which were suppose to be peppers, but were mislabeled. This entry was posted in Life, Lily, Mobile randomness and tagged Lil, Mobile randomness, Stuff.